Land mines remain among the most destructive remnants of 20th century warfare, continuing to slow resettlement and hinder recovery in many former war zones. While mine-clearing protocols have improved substantially since World War II, the technology used to locate buried landmines has changed little: De-miners use metal detectors to find and identify mines. On a battlefield strewn with metal debris, differentiating lethal mines from benign cans, wires, and casings is enormously time consuming. Now, computer scientists at the Harvard School of Engineering and Applied Sciences (SEAS) have designed an elegant system that ties in smartphones to assist humanitarian de-miners by augmenting the information supplied by their metal detectors. Their system, known as pattern enhancement tool for assisting land mine sensing (PETALS), and which will be presented at this weeks Conference on Human Factors in Computing Systems, takes de-mining advances in a new direction. We want to support people in the field with minimal invasiveness. Without changing their sweeping style, without giving them new procedures, this technology allows them to better visualize what they are detecting, explained SEAS researcher Lahiru Jayatilaka, who is working with Assistant Professor of Computer Science Krzysztof Gajos at SEAS, James Staszewski of Carnegie Mellon University, and Luca Bertuccelli of Massachusetts Institute of Technology. In the field, de-miners use a repetitive sweeping motion to systematically cover small sections of ground looking for land mines. When the metal detector passes over a metallic object, it beeps. 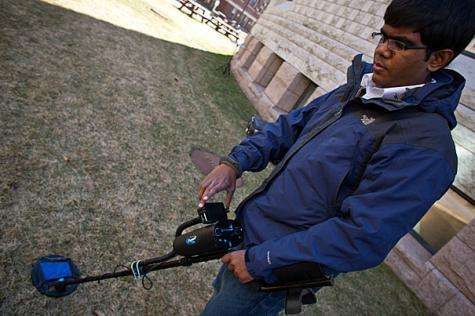 Expert de-miners are able to visualize the auditory feedback of the metal detector, creating in their heads an image of the objects outline underground. Land mines, with their circular construction and trigger pin, have an ovoid signature. The system designed by Jayatilaka and Gajos shows one red dot for every beep of the metal detector. With passes over a buried object, the picture shows an increasingly complete outline of the objects shape, giving the de-miner an evermore detailed picture of what may be buried there. Using only audio signals is a huge source of inefficiency. The operator has to figure out whether it is harmful or not harmful. If they are not completely sure, they have to go down on their hands and knees and excavate every piece of metal as if it were a land mine, explained Jayatilaka. Most humanitarian de-mining programs operate in developing countries where resources are highly constrained. Among the challenges Jayatilaka and Gajos faced was designing an affordable system requiring minimal field maintenance. Their solution involved a cheap and ubiquitous platform: the smartphone. The final version of PETALS is designed to run on a normal mobile device such as an iPhone, which can be mounted on a metal detector. In addition to increasing search efficiency, PETALS has the potential to help train new de-miners. In initial tests, novice de-miners performed 80 percent better with visual aid. Furthermore, Jayatilaka pointed out, training with a visual aid can help novices understand the principles of recognizing land mine signatures more quickly, allowing them to gain more from training. Wireless mine-rescue system tested in U.S.